Today I am sharing a new party theme I created! I invited my very dear and talented friend, Diane, to help me.She has a degree in design and a passion and gift for it! She helped me create my beautiful wedding. We both enjoy entertaining and we work very well together! I created the theme, threw my ideas in then she put her ideas in. 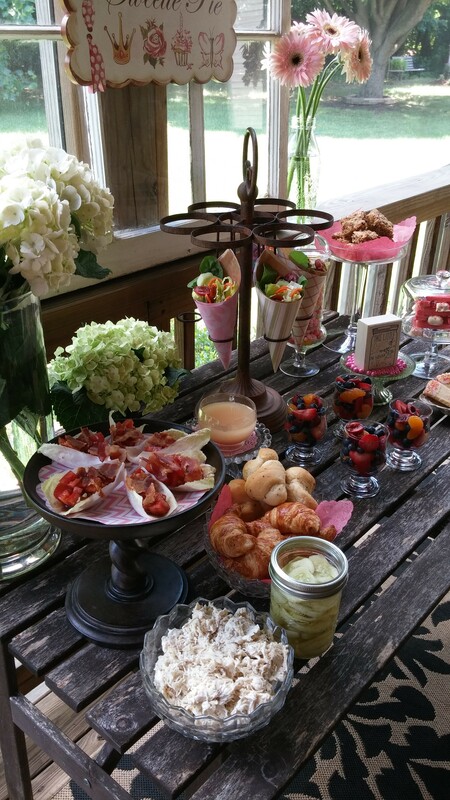 The theme was Rustic Elegance with a Flair of Fun! 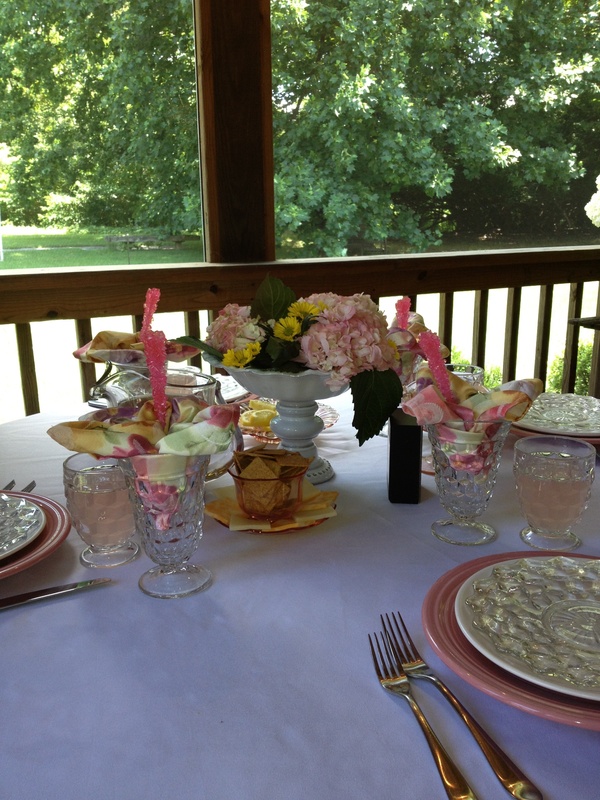 The theme was originally a Pink Picnic. First I pulled everything I had together then set out to find some treasures! 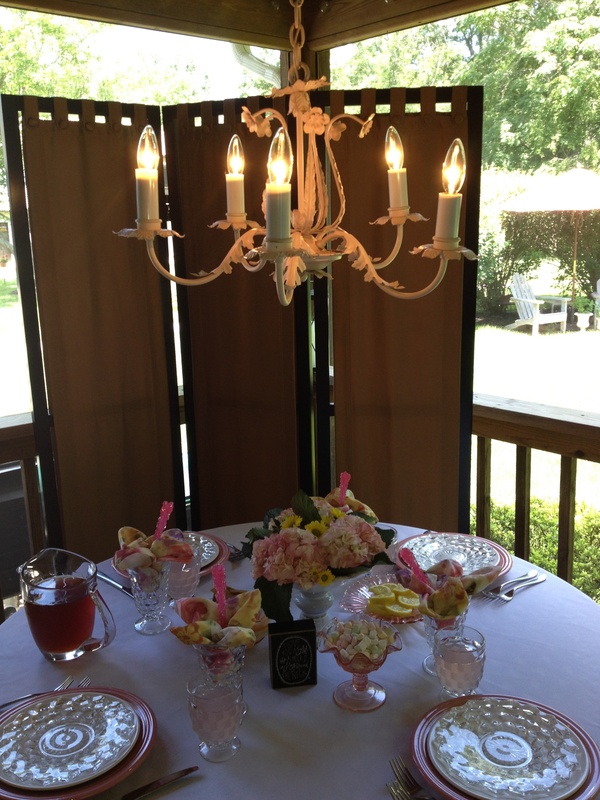 My first main focus was an inexpensive chandelier that I was going to paint pink. I knew this would not be an easy find as I have been searching for over a year for the perfect vintage chandelier for my dressing area. 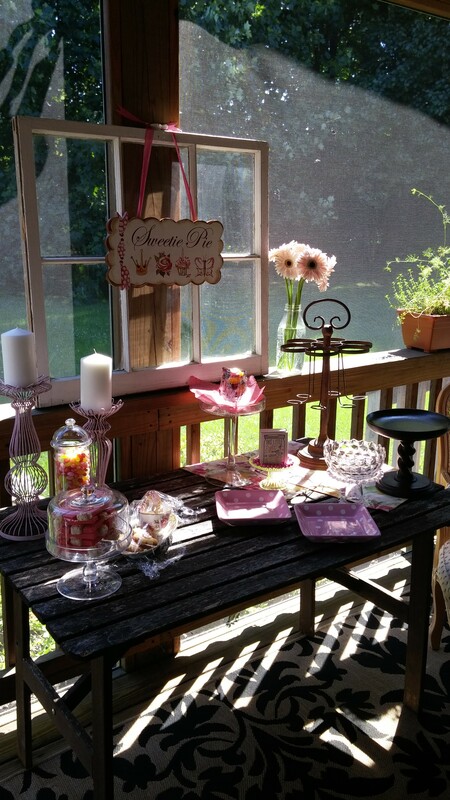 With my list in hand, my first stop was this wonderful vintage flea market in our area. It only happens once a year. 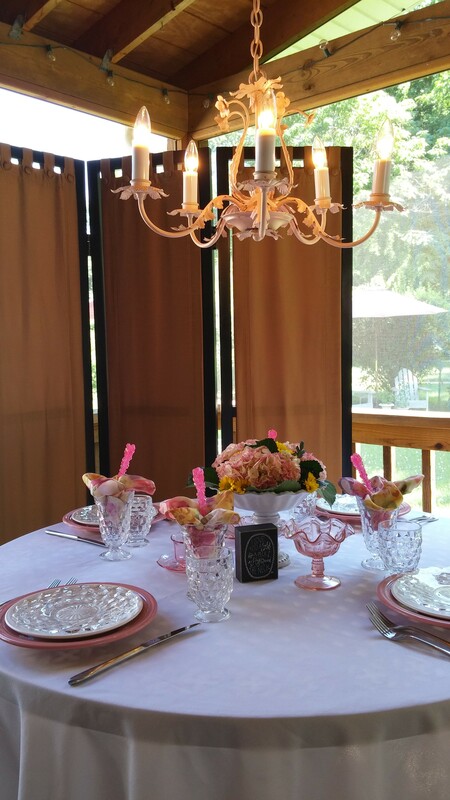 I was pleasantly surprised when I discovered not only a vintage chandelier but a pink one! No painting! It was exactly what I was looking for! It isn’t in the best shape but that gives it more charm. The other plus was it was three times LESS than my top I was going to pay! Back to the party….I put the menu together. The day before the party I started making the food. The day of, Diane arrived with her things and after a few hours, Voila…Rustic Elegance with a Flair of Fun was happening! 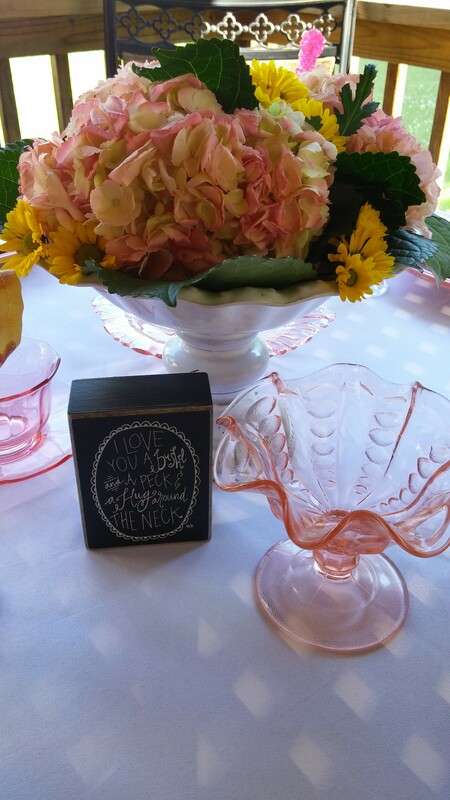 We used various containers that we both had and Diane created the florals. I LOVE flowers! 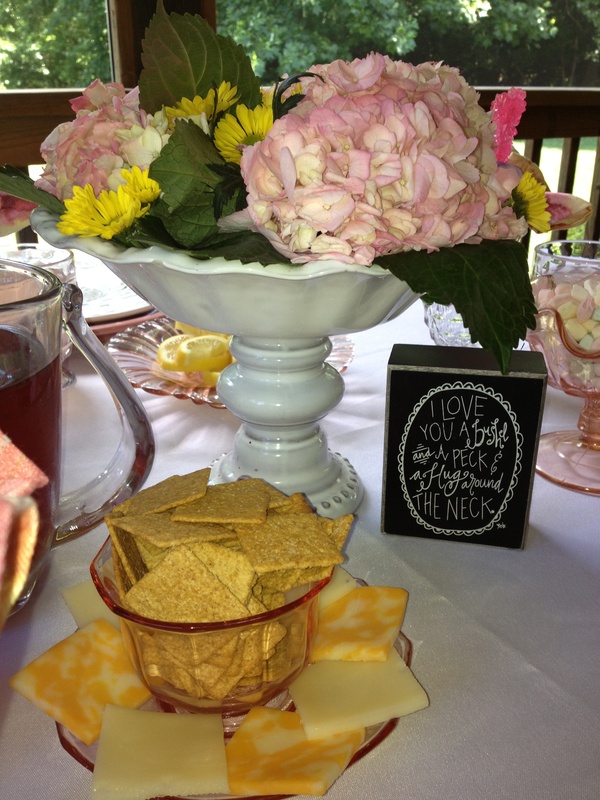 They add such a nice touch to any party or even the everyday! I had purchased pink and white flowers with a touch of yellow. Diane had the perfect chair to set near the food. Loved the touch of the chair! 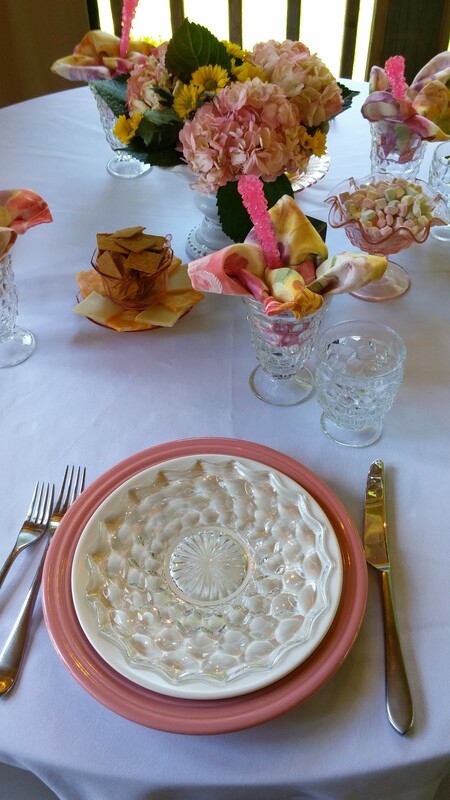 The Dinning Table…..We used a white table linen with Pink Fiesta ware, a white plate and a Fostoria plate. 2 size Fostoria glasses, the small for Pink Lemonade and the larger for Sweet Tea. I had a beautiful tablecloth that no longer ft any tables in my home. Diane made that into napkins for me! 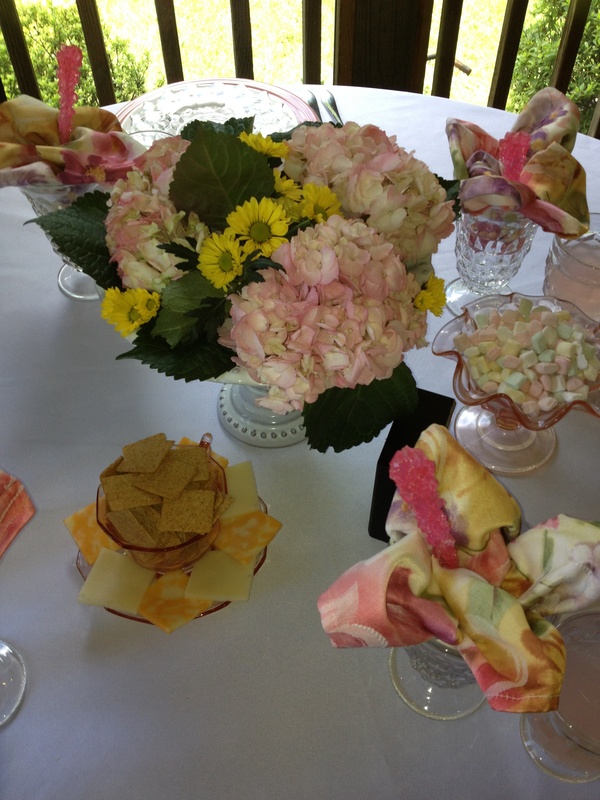 She found a tutorial online for folding napkins into flowers, so fun! For the flair of fun we added oink sugar sticks to the glasses inside the napkins. Also a cute block that says, I Love You a Bushel and a Peck and a hug around the neck! 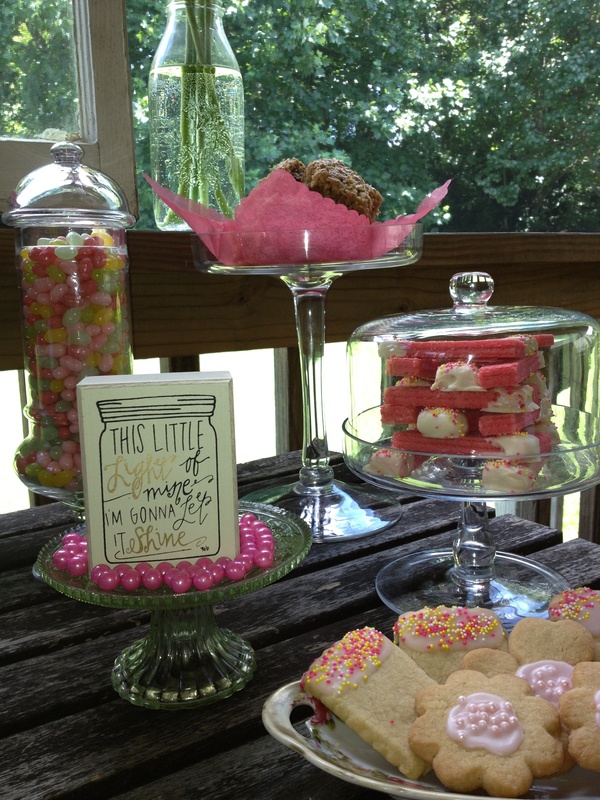 Food…Munchies on the dinning table were pastel mints in a vintage candy dish my mother gave me from her collection as a gift one year. Cheese and crackers in a pink tea cup my daughter had gotten me last year at the vintage flea market. I placed the crackers in the cup and cheese squares around the rim of the saucer. Loved this idea! 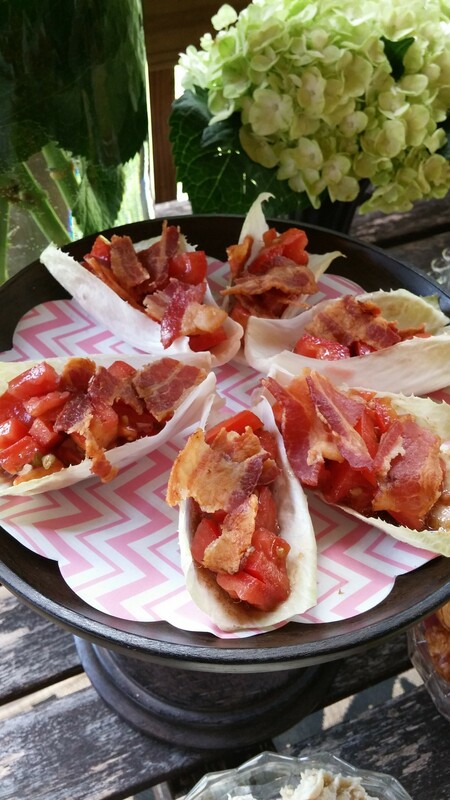 We made cones out of 12×12 scrapbook paper and lined them with brown parchment paper. You can find a tutorial online for cones, super easy once you get the hang of it! 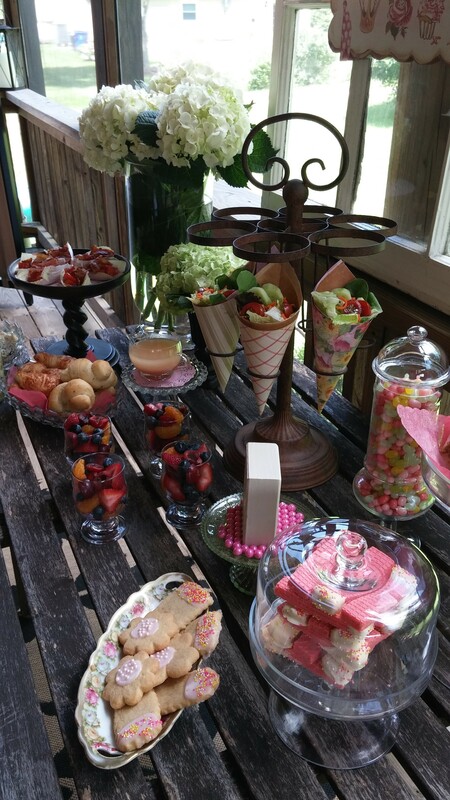 We served salad out of the cones with a Pink salad dressing. 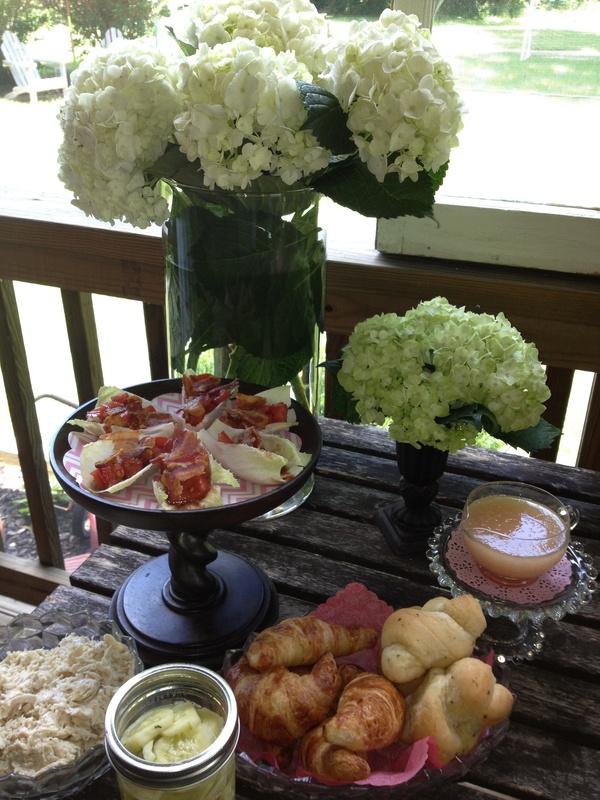 My famous chicken salad, bacon bruschetta on endive leaves, fruit salad in mini parfait glasses and marinated cucumbers served in a mason jar. YUM! 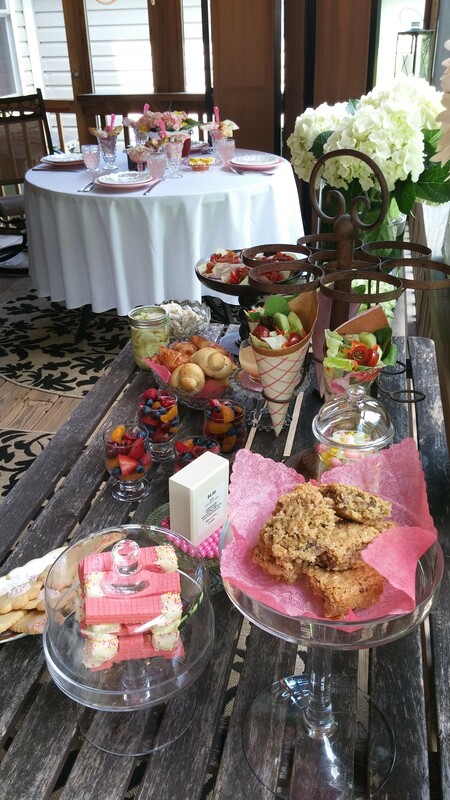 Desserts were simple…..pink sugar wafers dipped in white chocolate, oatmeal coconut bars, brown sugar shortbread with my cookie icing on top and beautiful colored Jelly Bellys. 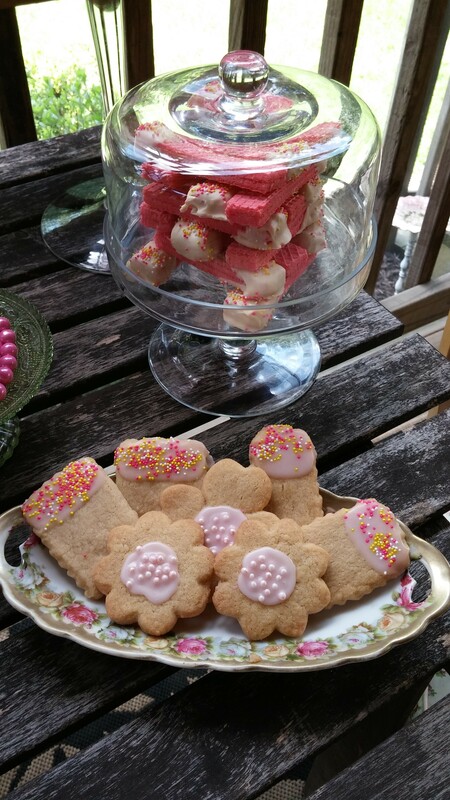 We had such a lovely time creating, planning and throwing this party! 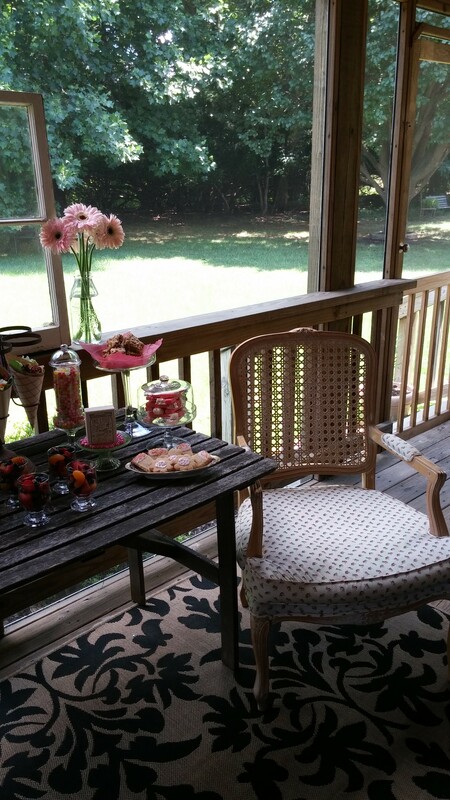 Take a journey through Rustic Elegance with the album of pictures below! ENJOY!